October 17th-23rd – College Park MD – From Philadelphia, I took a short drive over to an RV park in Maryland. I used this as a base of operations for several days where I went into the city a couple of times. I drove to the train station and rode the commuter rail into town to see Monuments and Museums a plenty. I arrived at Cherry Hill RV park in the early afternoon, on check in I was informed of a short seminar that afternoon about what to see and how to see it. I attended this very informative presentation (about 4pm) and came to learn about a bus tour that I would highly recommend. It is the DC by night tour. I found that this helped me get a feel for the places I’d like to visit later. 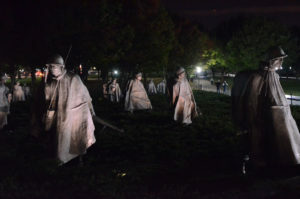 I got some great sightseeing in on what would otherwise have been just a travel day, and these monuments were absolutely worth seeing at night. The bus arrived and departed right from the campground. With fewer people and dramatic lighting, the warm evening was wonderful. Being a bit off season there were fewer of us on the tour and we got to talk both with one another and the tour guide/bus driver a bit more. I took the commuter train into the city a couple of times. I drove over to the station and parked, although a local bus comes right to the campground entrance. The one day this was because parking was free that day. The train was a simple to figure out, and I found that they had put some thought into the signage that told when trains were coming. Instead of telling you the time the train was supposed to arrive and then depending on your to look at your watch, or at a clock on the wall, it simply told you how many minutes until the train would arrive. The time was available too, in case that was important for your other scheduling needs. 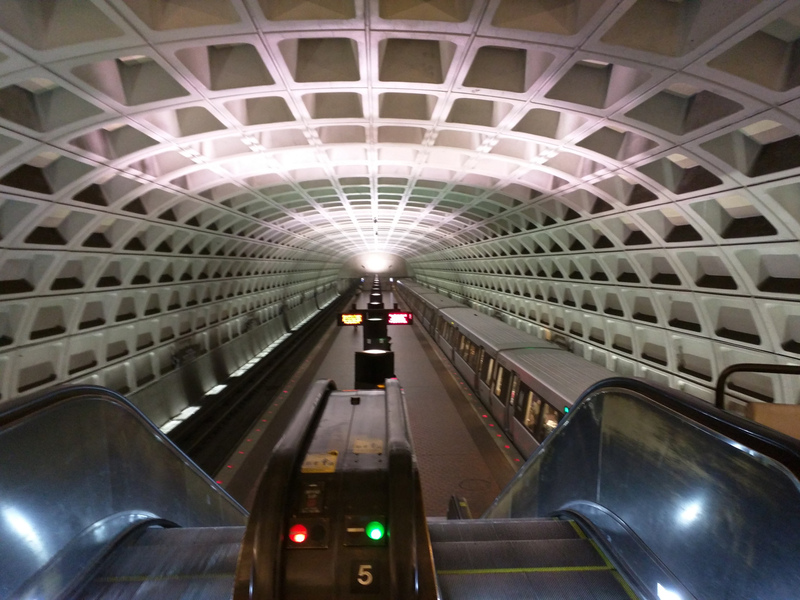 The train operators would call out the stations as they approached, and had some specific announcements they repeated at each stop. Some were much more understandable than others, but one stood out. His manner was very melodic and I thought afterwards that I should have recorded it, as it would have made for a wonderful sort of modern music, maybe with a little auto-tune. The National Archives was worth a short wait for entry. This is the home of the original Declaration of Independence, Constitution and the Bill of Rights as in the Rotunda. You could spend hours or days in the public vaults exhibits, but a good walk through is on the order of an hour. Photography isn’t allowed here, so its one that you’ll want to go and experience yourself. Of course no visit to Washington DC would be complete without at least a short stop at one of the many Smithsonian Museums. 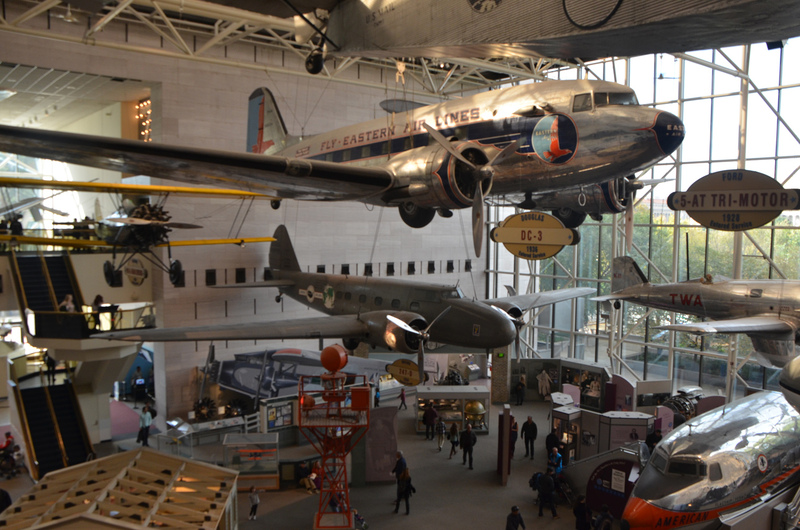 I spent most of my Smithsonian time predictably at the Air and Space Museum. I took in a couple of good shows in their planetarium, one narrated by Neil DeGrass Tyson. It wasn’t new information but it was well presented and tied together well. Lots of school kids at the museum, and bustling, but it is big and there is space to spread out. So it didn’t feel too crowded in the exhibits. I was really here to see the X-15. I had a model of this experimental craft when I was little and it stretched my imagination. It got a lot of use and abuse, flying and landing, often not so softly. So I spent a while looking it over as it hung from the ceiling. The rest was all gravy. I was a little shocked at one exhibit about GPS’s to see that several of the “old” units on display were actually ones that I had owned a long while back. I wandered the store too, and while I spotted the Astronaut’s Ice Cream, I refrained from buying any. I’m sure that my memory of it from 30 years ago is much better than it could possibly taste today. What I really miss (not really I guess) is the “space food sticks”, I think of that childhood snack another of those bygone imagination drivers. I made a quick walk through the Smithsonian Castle and learned a little about the history. How James Smithson left most of his wealth to his nephew Henry James Hungerford, and when he died without an heir bequeathed it to the United States to form the Smithsonian Institution. 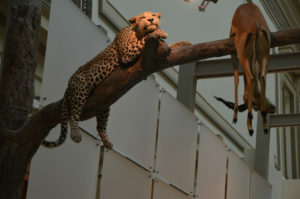 Also on the list was the Natural History Museum, where the taxidermy takes on an art of its own. With the animals posed in very natural and uncommon ways. For example, the tiger pouncing out of a second story exhibit directly above your entrance, or the leopard resting in a tree with its kill safely draped over a branch. In the mammals exhibit there was a short film on a loop with benches, set up so that it was pretty easy to come and go without bothering others much, the “Evolution Theater”. 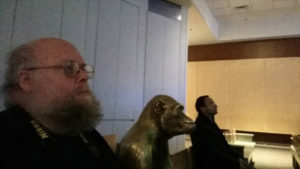 Sitting on one of the benches is a brass sculpture of an ape who appears to be watching the film. There is space to sit on either side of him. So I sat down next to him and tried to sort of mimic his pose and demeanor as if we were visiting together. A couple of folks saw as they entered and were lightly amused, but soon a mother with her two young sons came in. The five year old was looking around and noticed immediately. He pointed it out to his mother and he broke away and came running over to sit on the other side of the statue. Soon his younger brother came over too a little more sheepishly and they were both very interested in examining the statue. When I saw that this I asked the younger if he would like my seat, and he nodded most politely. So I got up and moved to the row behind where I could watch things unfold. The mother came over soon, after getting stuff organized in the stroller, it looked rather like they had been running her ragged. But they had quieted down and were petting the ape, and cuddling up with him and really enjoying the experience. The mother thanked me for giving up my seat and joined them and she talked every so quietly about the ape to them. I watched, and watched the movie, and when the spot in the loop where I came in came round again I slipped out. 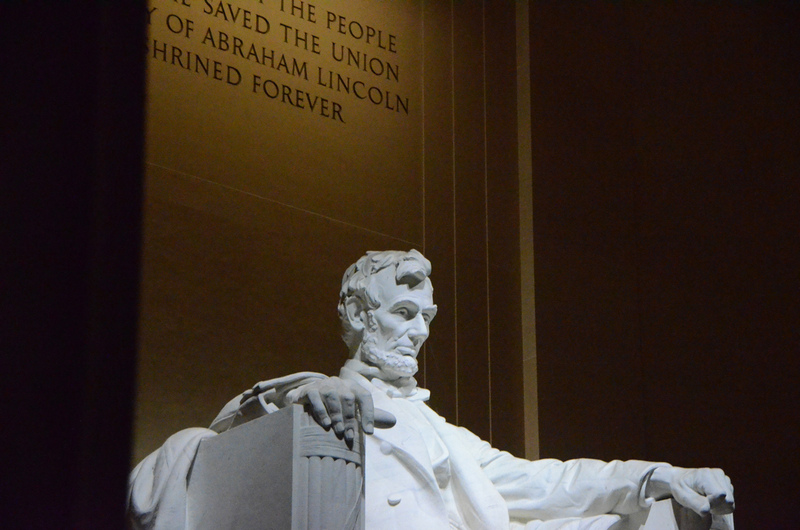 Of course the big photo opportunities in DC are the monuments. Lots of pictures there, often both from day and night visits. How long until the train arrives? Listed in minutes, no math required. Washington Monument. I didn’t try to get here early enough to get tickets to go up the monument. Notice the two types of stone, about 150 feet up. Construstion was paused due to lack of funds and the civil war. Resumed in 1877, the new stone was from another source. Looking down the reflecting pond to the Lincoln Memorial. Marble bench and flags encircle the base. Claes Oldenburg’s Typewriter Eraser. National Sculpture Garden. There’s another copy in Seattle on the waterfront, so this one was familiar to me. “Graft” at the National Sculpture Garden. Perhaps the smallest parking lot with a gate? Four spots, two handicapped. This public bus had fold down seats along the front lower section and straps for securing wheelchairs and the like. The seats are up when not occupied. Throughout the bus were these USB power outlets for passengers. 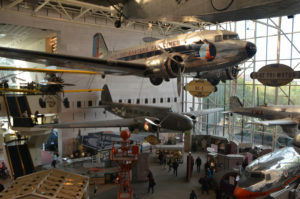 Air and Space Museum. The DC-3, now that is an iconic airplane. 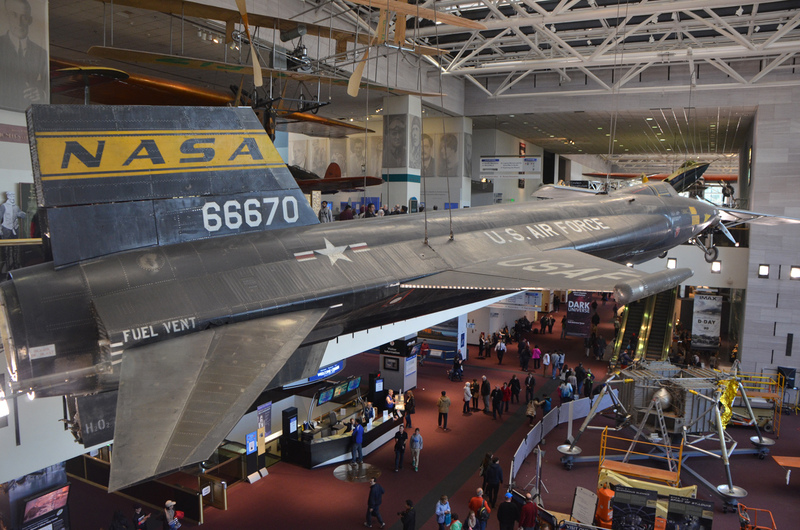 The X-15. First time I’ve seen it in person, but I had a model when I was five that held my imagination and may still today. Wright Flyer. Didn’t know I was going to Kitty Hawk later. 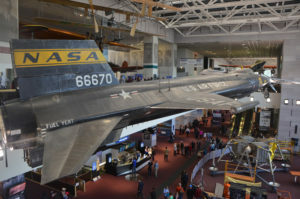 We lived near Dayton Ohio for a year or so when I was little, and I remember one of these there at the museum at Wright Patterson AFB. The telegram and the key that sent it. German V2 missle. I had an Estes model of one of these that I flew in Middle School. Ha, my old GPS is on display. The Magellan 2000 XL was my first GPS. A panel retrieved from the Hubble space telescope. An explanation of why the panel in the previous pic is full of holes. Freeze Dried Strawberries, $7 for half an once here, or 16 times that for $30 at Winco. Freeze Dried Ice Cream. I remember the magic when I was little. I’m afraid its probably not as magical as the memory. Elephant in the lobby of the Natural History Museum. I don’t think the other guy (right) was trying to pose, but it sure worked out well. See the giraffe through the window. Around the corner see the giraffe. Look up as you walk into the hall of mammals. Pause and let your kids discover it themselves. I’ve not seen a pose like this before. A well fed (house) cat can sleep 20 hours a day. DC traffic on the night tour got pretty bad. Something had one of the main streets closed. Apparently not all that uncommon. Front of the White House at night. Some folks holding a candle light vigil here, a news crew. Lots of folks wandering around. The fence makes getting a photo pretty problematic. Trees too. But for record keeping purposes, here I am. Walking back to the bus from the Front of the White House. 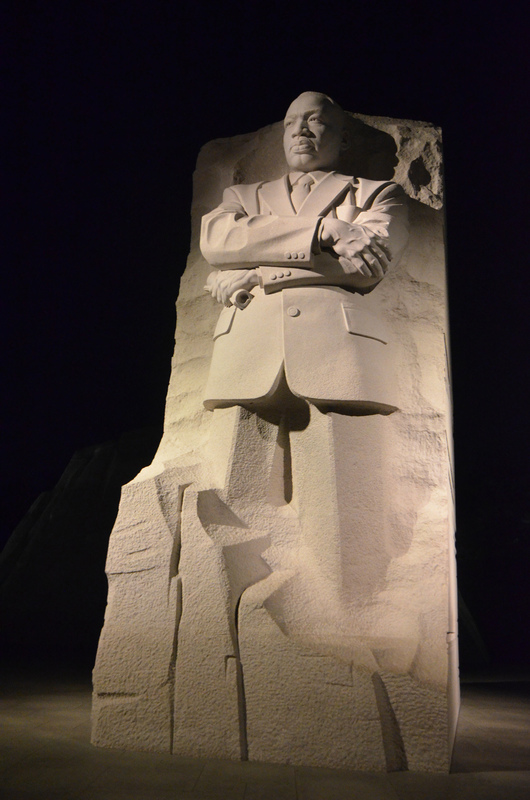 The Martin Luther King Jr memorial, day time. MLK Jr, the wall has quotes, the statue and rocks are in the center and this wall extends on both sides. Franklin Delano Roosevelt Memorial is in four parts, for his four terms. Lots of folks were having their photo taken standing in line. It was interesting to watch who chose to be at the front or the back of the line. Front was more common. We only had a few minutes here, maybe five minutes because we had been so delayed by traffic. The wind was blowing the flag around, and things were very dark. But I clicked off photos as I walked and hoped a lot. Washington monument was actually the tallest building on earth until the Eifel Tower. You can see his statue in the middle there. Marble floor and columns, dramatic lighting. 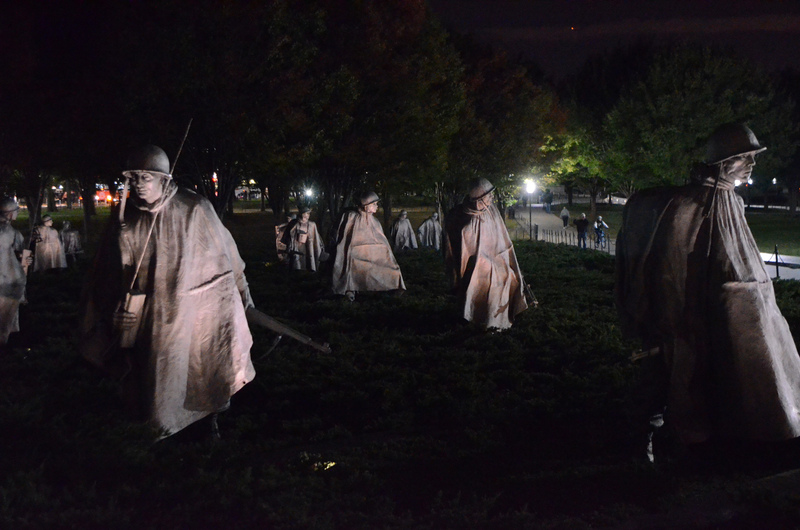 When viewed in the polished marble wall, there appear to be 38 statues, representing the 38th parallel where the war was fought. This apple fritter was at the local grocery store. The dollar is there for scale, but it was also to remind me that this was only 69 cents. So big I basically sliced it like a loaf of bread. Looking down the reflecting pond from the Lincoln Memorial. The hands are so powerful in this sculpture.